BRUNSWICK, Ga. -- Residents and visitors to Georgia’s coast may not know Elizabeth Cheney – but they’ve probably seen her handiwork. As the beach water-quality manager for the Coastal Resources Division (CRD) of Georgia Department of Natural Resources (DNR), Cheney oversees water testing at the state’s most popular beaches. 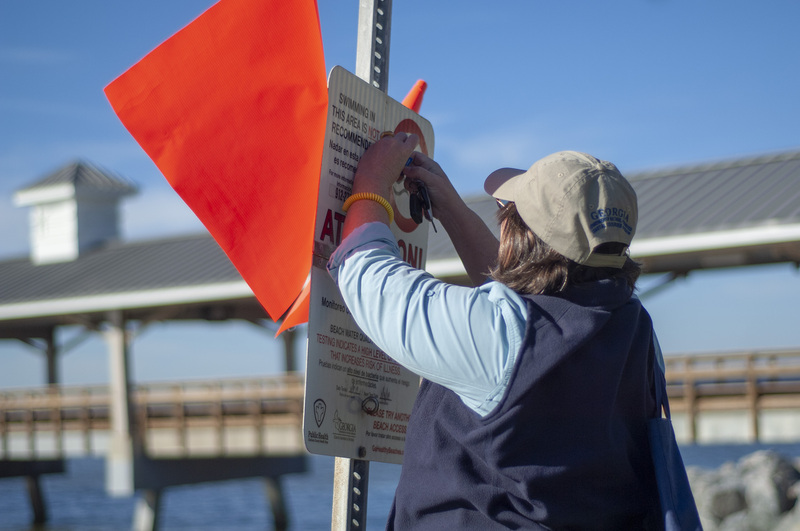 The water-quality monitoring signs posted at beach accesses on Jekyll, St. Simons and Tybee islands are her domain, and she takes her role seriously. Most of Georgia’s beaches are exceptionally clean, she noted. Part of that cleanliness is due to good land management by local governments. In fact, the U.S. Environmental Protection Agency gave the state a nearly perfect score for beach-water cleanliness in 2017, the most recent available year of data. Cheney’s work is funded by the EPA under the Beaches Environmental Assessment and Coastal Health (“BEACH”) Act, a law passed by Congress in 2000. The law was an update to the Clean Water Act of 1977 and requires beach states to test for potentially harmful bacteria, and to inform the public when swimming may be unsafe. Since then, the beach water-quality monitoring program has evolved into a multi-agency partnership that includes DPH, EPD, CRD and beach management agencies including the Jekyll Island Authority, city of Tybee Island and Glynn County. When CRD staff tests beach water, technicians are looking for the presence a bacteria known as enterococcus. This bacteria lives in the guts of warm-blooded animals, including humans, and is a good indicator for scientists who want to measure the safety of beach water. Georgians and visitors to the state’s coast can always check on their favorite beach site by visiting GAHealthyBeaches.org or CoastalGADNR.org/HealthyBeaches for current advisories and more information. The signs posted at beach accesses are also regularly updated year-round to reflect current conditions. The Coastal Resources Division’s beach water-quality monitoring is part of the Georgia Coastal Management Program, which balances economic development along Georgia’s coast with the preservation of natural, environmental, historic and recreational resources for the benefit of the state’s present and future generations.